Services Our office utilizes state-of-art equipment and materials in order to provide the highest quality of cosmetic dental services, and help every patient achieve the smile they have always wanted. 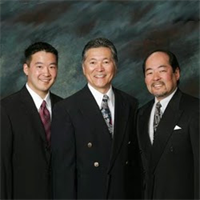 Doctors Chin, Miyasaki and Jen Kin continue to keep up to date with any changes occurring in the world of dentistry, so they can handle any situation they may come to face. They take the time to discuss one-on-one with every patient about their cosmetic dentistry options and what fits their needs, as well as their budget.